Les Williams, a permanent feature of Liverpool Pembroke and later Liverpool Pembroke and Sefton for decades. A meticulous administrator, official and coach he was a credit to his club, county and to the sport generally. Although his background was distance running with Victoria Park Harriers he came north and took to coaching the high jump and hurdles in particular. He was renowned for his technical expertise and had an extensive library he had clearly studied in detail. The many athletes he coached will recall his knowledge, commitment and empathy.As a colleague in the club he was utterly loyal and reliable and took on many routine and onerous tasks cheerfully. He particularly loved the Scouse humour and repartee of Merseyside and chuckle at the banter. He never jumped to immediate conclusions but would mull things over before presenting a carefully thought through case. I miss his advice. He represented for me the finest elements of athletics, the old fashioned Corinthian spirit, sadly in decline. He was above all else a gentleman and a gentle man. My thoughts go out to his wife Brenda. Les Williams to me was a very well mannered, kind hearted person who put himself out for a lot of athletes, including myself. Had he not done we would not have enjoyed the sport or had the pleasure of his wisdom, friendship and team / individual successes. Thank you so much Les. All my love to you & Brenda from the little girl you nicknamed “Mascot” Wood! Les was a very modest, humble man. Indeed I must have known him almost 30 years before I discovered through my research of LPS, that he had coached one of the country’s best long jumpers, Geoff Hignett, in the 1970’s. When I asked him about this he pondered for a few moments (as was his way, Les never spoke in haste) and merely said, “Not bad, could have been a reasonable sprinter too”. That was Les to a ‘T’, never prone to hyperbole his thoughts and deeds were always preceded by measured consideration. His quiet demeanour disguised a depth of knowledge, built over the years, which would be the envy of many today. He gave countless young athletes a solid grounding in athletics but made in greatest mark on two multi-eventers. Steve Rogers was both an indoor and outdoor AAA’s Champion; Alex Kruger went to two Olympic Games and is still no 3 on the British all-time list. Behind them all was a quiet man who never stood out in a crowd, the way a good coach should be. What sad news to hear about Les. 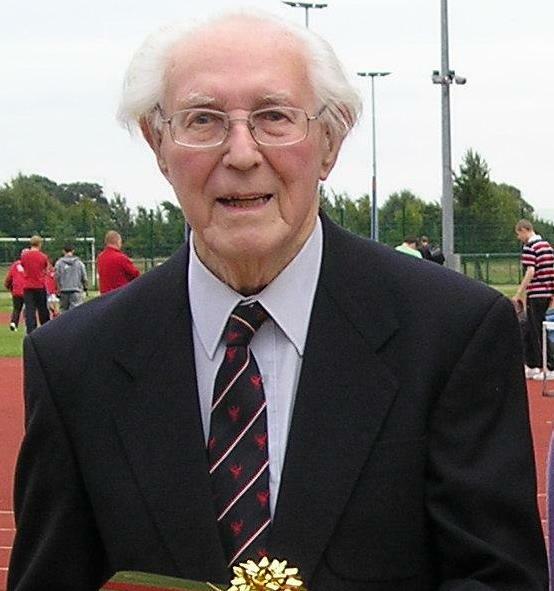 Les was a very nice man, he was one of the coaches who helped to build a thriving field events section over many years and was dedicated to the club and the sport. He had a calm and patient way of coaching and many athletes over the years have benefited from this approach. I have fond memories of being out of breath after a track effort at the Kirkby track and Les giving me a knowing pat on the back with a few dry comments! He was definitely from a different generation and represented everything that was and is great about amateur athletics. I first met Les when I joined Victoria Park Harriers in 1948. We were both club athletes enjoying our chosen sport. Both of us attended coaching courses at the CCPR in London and had the ability to pass on our knowledge and experience to younger promising athletes. In 1962 I moved to Switzerland and a couple of years later Les moved to the Liverpool area. We both continued doing what we liked best, namely, coaching. We kept in regular contact by letter, meetings and phone until the last phone call from me on 9th March this year. I knew the health of Les had deteriorated and a few minutes after Brenda has filled me in on his condition, she asked me whether I would like to speak to him. I said yes. She showed him a photo of me which helped trigger off with whom he was going to talk to. By recalling little things from the past, I rekindled some of his memories but he was having difficulties finding the right words. I am so pleased I made the call and when Breda took the phone again, she said she had never seen him socheerful and perky for a long, long time. My call did both of them good, which in turn did me good. I did not believe it would be the last call to Les so I am so pleased I made it. At this very sad moment in time, my wife Gerda send Brenda our heartfelt condolences and wish her much strength. Dave McComb Snr, and family. A coach and administrator of great quality never shy from taking on responsibility Les was a regular at local events. County treasurer for many years and then later President of Merseyside County AA as well as being President of Liverpool Pembroke Sefton until his illness forced him to step down in 2009. Thoughtful and wise are my lasting memories of this very giving man.